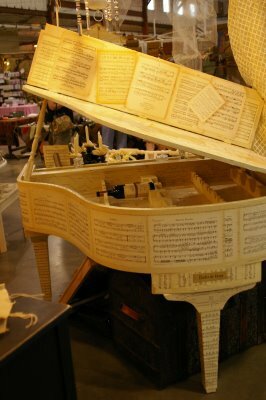 Project Description: Bob Kennedy, owner/designer of Retreat, created a show-stopping piece of ‘re-purposed’ furniture, a unique and original work of art: a serving bar created from the carcass of a baby grand piano! How he did it: The damaged piano carcass was gutted and rebuilt, with storage for a wine collection, liquor, and glassware, plus a pull-out mirrored tray for serving. 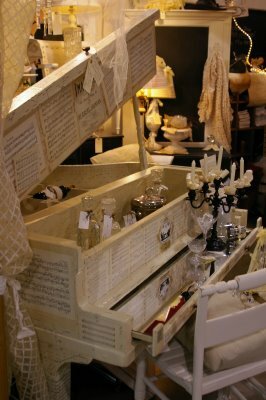 It is covered with a collage of original vintage sheet & player piano music. Advice : Not a project for the faint of heart! The harp removal took the strength of two men. The deconstruction and rebuilding of the casework was a 40 hour project by Bob, and the collage work was another 40 hours in a ‘clean room’ by his wife Deb. Transporting, assembling, and displaying the Piano Bar takes both of them, a specialized wheeled cart, and a truck & trailer rig! Do you have a RE Store-inspired project to be proud of? Please, show off & share your story!